Back in Print! This is the story of the dramatic conversion and inspiring life of the soldier Camillus de Lellis who lived in the late 1500’s, and became the founder of the religious order known then as “Ministers of the Sick”, and now called the “Camillians”. His story is one that is filled with drama: military battles, sickness and disease, conversion to God, and great charity for countless suffering people. Camillus was a very worldly man, a huge man at 6 foot 6 inches height, a soldier who fought against the Turks, and one who had a terrible addiction to gambling that continually reduced him to poverty and shame. He also suffered tremendously throughout his life from various ongoing ailments. After his conversion, though continually suffering himself, none of his own great sufferings kept him from always thinking of others first, and striving to serve the many sick and dying people under his care. Pope Leo XIII canonized him in 1746 and declared Camillus the Patron of the Sick. This is a very "readable" and fast-moving book that will be enjoyed even by those who do not normally like to read. It will especially appeal to boys from grades 7-12. 190 pp. Soft cover. I have been working with children in education for over seventeen years and if there was only one book I could recommend that every Catholic adolescent must read, it would have to be "A Soldier Surrenders" (number two would be the author's other book, "Crusader King")! This story of St. Camillus' conversion is fast-paced, full of excitement, battles, everything a teenager loves (both boys and even girls, and, yes, their parents too!) yet after reading it, no one will EVER be able to say again that they themselves can not become a saint, and a great saint at that! If our rough and stubborn hero Camillus de Lellis could reach total surrender to God, then we ALL can! No excuses! I only regret this treasure of his amazing story is so little known! 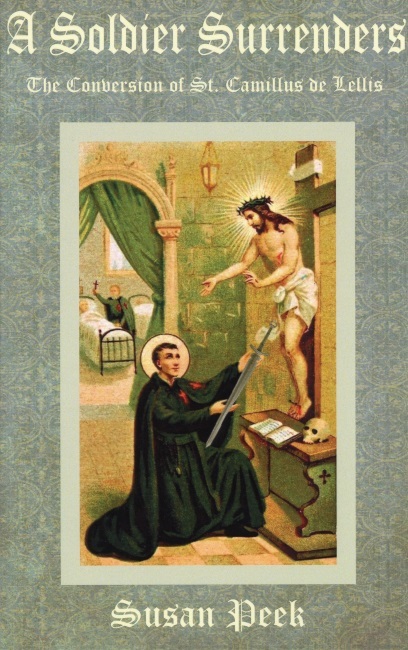 Susan Peek's book on St. Camillus, A Soldier Surrenders, is the story of a truly great saint, yet one who really struggled with his sins and bad habits. He will be a very powerful friend for anyone who gets to know him. I highly recommend this novel. It's fast paced, has lots of action, and will really inspire anyone who reads it. I would love to see it eventually in Seton's required book reports. Thanks for carrying it!